“Arsenal After Chapman” is the fifth in the series of publications from AISA, the Arsenal Independent Supporters Association, which puts a new light on Arsenal’s history. It is a series that has had at its aim, not just the telling of the Arsenal story, but of unravelling past myths and unchecked tales, and uncovering facts that have been forgotten but which are central to the full understanding of the Arsenal story. The series started with a re-evaluation of Arsenal’s foundation and early years, and which has looked at the bankruptcy of the club and the subsequent Norris takeover, the move to Highbury, the Knighton years, and then the Chapman era. This latest volume considers the reign of Joe Shaw, one of Arsenal’s forgotten managers (but a league winner for all that), and George Allison. In the course of this on-going research we’ve uncovered the 1892 split in the club which led to Arsenal moving ground and applying for a place in the Football League, while those who had sought to take over Arsenal moved to set up a new rival club playing in the Southern League in a stadium virtually opposite Arsenal’s ground. We’ve also set to rest the notion that the club’s move to professionalism caused a rift with all the other clubs in London and Kent which (earlier reports have claimed) resulted in the club’s near bankruptcy. The role of Henry Norris – often seen as the unmentionable part of Arsenal’s history – has been re-evaluated, and the extraordinary level of his personal commitment to the club, both in terms of time and money, has been revealed. Indeed there’s no doubt that without Norris there would have been no Arsenal after 1910. Our third volume (“Wartime, Promotion and the pre-Chapman Years”) gives the first in depth analysis of what happened when Arsenal moved and were subsequently elected back to the first division. Again, the old myths of something dark and nasty going on are swept aside, and the truth is revealed to be quite different. Volume four is devoted to Chapman, and a review of his teams, and how he went about taking a club that had never won a major trophy into being the biggest footballing club in the land. Now our fifth volume considers what happened after Chapman’s sudden death. Many volumes suggest that George Allison took over the management straight away – but this is far from the truth. However we never stop with just the facts, for the driving force behind these publications is always to find out not just exactly what happened, but perhaps more importantly why. In the case of Allison, the question of why he did not become manager upon Chapman’s death has never been examined before – and here the answer is finally set out. 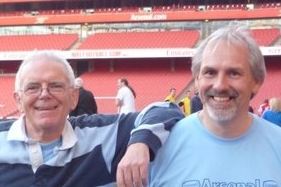 So we consider Allison’s extraordinary life – a life totally integrated with Arsenal. But also a life involved with American press barons, government and military leaders, and indeed the BBC, where he was their lead commentator on football in the early days of radio. Allison’s life story is one of the great stories of footballing men, and it has been a pleasure to review it, to re-read his autobiography, and to consider this one man’s staggering impact on football and on Arsenal. If you are a member of AISA in the UK you should have received your copy by today – overseas members will, I guess, have to wait a few days more. If you are not a member and would like to join or buy copies of the earlier volumes, please do visit the AISA site. I really do hope you enjoy this volume and find it adds to your knowledge – and indeed have enjoyed the series so far. I’m already starting to think about Volume 6 – Tom Whittaker: the end of the dynasty.